Dance, dance, dance, throw rocket, touchdown. UW could have pulled within two. 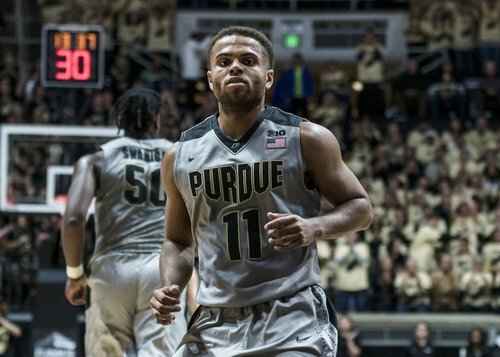 Trice misses a layup, Purdue rattles off a 5-0 run and now leads 45-36 with 12:57 left. Huge swing. Trice misses lay-in for #Badgers and Boilers get a 3. Happ misses inside and Boilers score for 45-36 lead. P.J. 's like... I got this. RYAN CLINE FOR THREEEEEEEEE ???????? Purdue lead reaches 12 after a turnover by Illikainen and a 3 by Ryan Cline. #Badgers down 48-36 with 11:57 left. Purdue on an 8-0 run and leads 48-36 with 11:57 remaining. Boilers on a 8-0 run over the last 1:42 ???? And it works out for McCarthy. #Badgers down by 14, Purdue heading to the line. We have 10:16 left. Don't see the visitors overcoming this deficit. Vitto Brown picks up 4th foul - Purdue on 12-0 run now, trailing 52-36. Oh, boy. #Packers with the Hail Mary for the touchdown. Just like 2011 -- expect the other side. #Packers payback 2011 Hail Mary from the Giants with their own, take a 14-6 lead at the half. How does nobody touch that? Good lord. 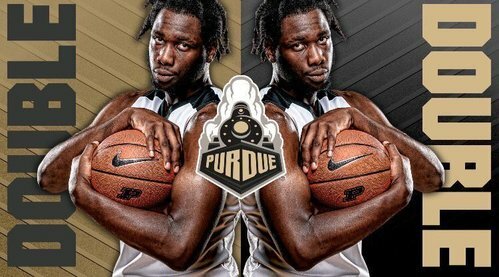 Swanigan up to 18 points, 10 rebounds. Purdue up 57-42 with 7:20 left. #Badgers are 1-10 from three-point range; Koenig has only 3 FGAs and Purdue has a 15-point lead with 7:20 left. Haas has 10 points in 14 minutes. He can add to it when play resumes. Purdue up 61-48 with 3:46 left.